Franklin Collection features beautiful, rustic hardwood flooring with refined, distinct features for added beauty. Extraordinary knots and heavy character coupled with the wire-brushed texture adds visual appeal to each plank. This solid hardwood flooring is made with the highest standards in manufacturing, achieving unmatched quality and detail in every plank. This flooring meets all environmental standards and is CARB II and Lacey Act compliant. 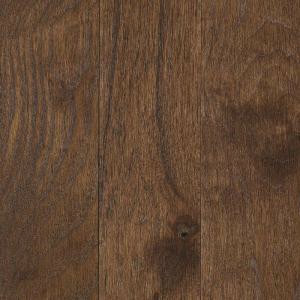 Buy online Take Home Sample - Franklin Coffee Bean Hickory 3/4 in. Thick x 3-1/4 in. Wide Solid Hardwood - 5 in. x 7 in. UN-857049, leave review and share Your friends.